Rice is Japan's most important crop, and has been cultivated by the Japanese for over 2000 years. Its fundamental importance to the country and its culture is reflected by the facts that rice was once used as a currency, and that the Japanese word for cooked rice (gohan) has also the general meaning of "meal". The literal meaning of breakfast (asagohan), for example, is "morning rice". Japanese rice is short grain rice that becomes sticky when cooked. Most rice is sold as hakumai ("white rice"), with the outer portion of the grains (nuka) polished away. Unpolished rice (gemmai) is considered less delicious by most people, but its popularity has been increasing recently because gemmai is more nutritious and healthier than hakumai. A second major rice variety used in Japan is mochi rice. Cooked mochi rice is more sticky than conventional Japanese rice, and it is commonly used for sekihan (cooked mochi rice with red beans) or pounded into rice cakes. Rice is processed into various products and prepared in many different ways. Some popular processed rice products are listed below, while a list of popular rice dishes can be found here. Mochi (or omochi) are small rice cakes, produced by pounding mochi rice. They are traditionally eaten on New Year, but have now become available throughout the year. Mochi rice cakes are usually grilled and then served in a soup or wrapped in nori seaweed. Rice wine is commonly known as sake, which is actually the general term for "alcohol" in Japanese. The two main ingredients of sake are rice and water. Please visit the special sake information page for more information. Rice flour is used in various Japanese sweets (wagashi) and rice crackers (sembei). Daifuku, for example, is sweetened red bean paste wrapped in rice flour dough, while kushi-dango are rice flour dumplings on skewers. 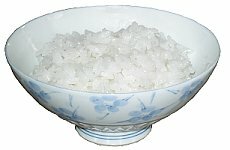 Rice is also used to produce vinegar, which in turn can be used as any other type of vinegar, for example, in salads or for preparing sushi rice.